It is illegal to cycle on a public road after dark without lights and reflectors. Exactly which lights and reflectors, where to fit them and when to light up, is defined by the Road Vehicles Lighting Regulations. Lights and reflectors are required on a pedal cycle only between sunset and sunrise. Lights and reflectors are not required when the cycle is stationary or being pushed along the roadside. When they are required, the lights and reflectors listed below must be clean and working properly. It's no defence to say that it was past sunset but not yet dark. The legal lighting obligations for cyclists are determined by sunset and sunrise times, not the 'hours of darkness', which start 30 minutes after the former, end 30 minutes before the latter, and dictate when motorists must switch from sidelights to headlights. Pedal Bicycles Safety Regulations (PBSR) are intended to ensure that new bicycles are safe when sold. Some are sold with several extra reflectors (yellow or white reflectors placed in the spokes) which are not required by RVLR. At least one lamp is required, showing a white light, positioned centrally or offside (the right-hand side of the bike), up to 1500mm from the ground, aligned towards and visible from the front. If capable of emitting a steady light, it must be marked as conforming to BS6102/3 or an equivalent EC standard. If capable of emitting only a flashing light, it must emit at least 4 candelas which is equivalent to about 48 lumens. The tiny blinky flashing lights which usually put out around 25 lumens are technically not enough on their own so you'll need at least two of them. One is required, to show a red light, positioned centrally or offside (the right-hand side of the bike), between 350mm and 1500mm from the ground, at or near the rear, aligned towards and visible from behind. If capable of emitting a steady light it must be marked as conforming to BS3648, or BS6102/3, or an equivalent EC standard. If capable of emitting only a flashing light, it must emit at least 4 candelas (equivalent to about 48 lumens.) and flash at between 60 and 240 times per minute (1 – 4Hz). A light obscured by a saddlebag isn't legal and neither is a torch on your head, although there's nothing to stop you using a head-torch as an optional or additional light. Optional or additional lights do not need to comply with the minimum lighting requirements, although you can't have a red light at the front of your bike or a white light at the rear, so red white and blue flashing lights are not an option. Unlike with other vehicles, lights are not a legal requirement for cyclists during the daytime when there is seriously reduced visibility, although we wouldn't recommend cycling through dense fog without having your lights on. One rear reflector is required, coloured red, marked BS6102/2 (or equivalent), positioned centrally or offside (on the right-hand side of the bike), between 250mm and 900mm from the ground, at or near the rear, aligned towards and visible from behind. 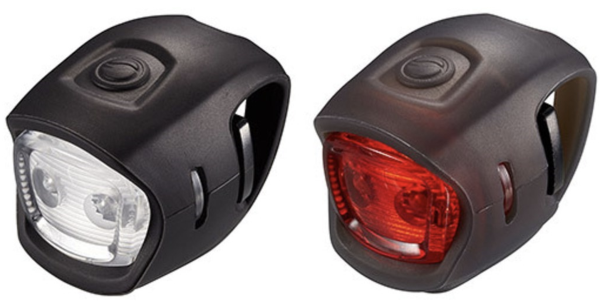 There are a few bicycle light units that have reflectors included. So, if you don't want a separate rear reflector on your bike, then to comply with the law when you ride in darkness, it would be sensible to purchase one of these lights. If you're going to ride your bicycle in the dark, then four pedal reflectors are required; coloured amber, marked BS6102/2 (or equivalent), and positioned so that one is plainly visible to the front and another to the rear of each pedal. Most many modern pedals, such as clipless systems won't allow you to fix pedal reflectors to them so, technically, they should not be used in the dark. Reflective ankle bands are a suitable, though not legal, substitute.